We cannot wait to welcome you to Mercure Port of Echuca! Located in Echuca, the four-star Mercure Port of Echuca is within walking distance to the paddlesteamers, old Port area, shopping district, restaurants and bars. With its restaurant, function facilities, and outdoor pool, the hotel has everything you need for both business and leisure travellers alike. The Port Bar AND Grill has recently changed ownership and although located within the hotel is now managed by an independent company therefore AccorPlus dining discounts are no longer available. The bar area is great for the business travellers with its comfortable seating, double sided fireplace and huge plasma. Enjoy your meal while reading the papers, watching the latest news and sports or chatting to our friendly staff. A very pleasant overnight stay in a spacious, well appointed room. Extremely friendly and efficient staff st reception and in the restaurant. The location was ideal - easy walking distance to the Port of Echuca and other attractions. A restful stop before a busy Sunday, with an early start aided by the extra hour. Outside sounds did not intrude. I admired the woman at the restaurant who was front of house, barmaid and waitress with no help except in the kitchen. Great service! 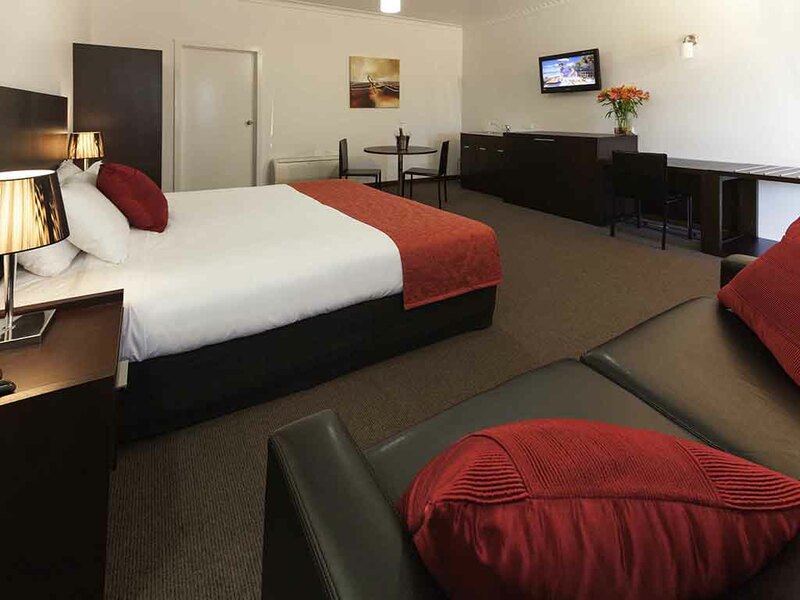 Staying at the Port of Echuca is a pleasant experience and always find the staff pleasant and helpful with great facilities on site with restaurant and very convenient to the wharf district of Echuca with comfortable rooms with plenty of room to relax. Can not wait until the next stay in Echuca. I have stayed here a number of times and this time my room was the best yet. Large bath room and generous room, very clean and fresh. Only issue I had was no restaurant service that night as there was a private function, couldn't even get room service meal which was disappointing as it was one of the reasons I chose this hotel. As I booked the day before over the phone, it would have been nice to have been forewarned. Water pressure is very poor. Condiments are all stored at floor level. Very annoying for anyone elderly. Room facing the Main road - Trucks all night, Silver member yet no water or welcome drink offerd. My mother and I had a lovely stay , once again. As we did last year. Choosing to return for a second time. The room was clean and beds comfortable. The staff were lovely. The only downside to our stay, was the difficulty of getting into the room as my mother had a walker and had problems getting up the step into the room. A staff member was very helpful loaning us a ramp. Thank you. I’m a single mum of 2 kids, dog, cat and work full time. I’m busy and sometimes would just like some time to myself. I booked in for 2 nights from the 22/3 to 24/3. I was so looking forward to a sleep in. Watching tv, swimming, shopping, eating whatever I wanted when I wanted without having to share with anyone. Selfish I know. I also had work to do so I set my laptops up and I was set for a relaxing weekend and if I got some work done, bonus. If I didn’t, it didn’t matter. Do not stay here if you intend on having a sleep in. At least don’t bank on one in room 55. Turns out my room was stuck between the guest & housekeeping laundry and the housekeeping supply room. My room backs onto sheds & external mechanical/plumbing equipment to run air conditioners and the like for many of the rooms including the industrial laundry. It’s so noisy. When the upstairs room went to the toilet it sounded like a large wave gushing and hitting large rocks. The noise went right through my room. I booked the room from Booking.com and got a great price I thought. Now I know why it was so good, no one likes the room so they sell it cheap to get occupancy. I booked a standard room. What I got had a spa bath that looks like it came from the 1960s. It even had a bar! The room was outdated crying for a do over. It was so outdated that there was even instructions on how to get pay tv! When I called reception to say the instructions don’t work, the receptionist said that’s because the tvs had been upgraded over 3yrs ago! I’ve taken photos of every aspect of the room. You’ll see I was there to get a lot done! This weekend turned into a disaster! I couldn’t sleep because of all the noise from upstairs, the back of my room and because the room was smack in between the laundry and house keeping. The upstairs toilet and/or outside plumbing went all night and then the noise started very early in the morning from guests (sounding like running on the balcony) and housekeeping organising their cleaning run. There was absolutely no consideration for anyone else that was staying. I was checking out! I’d hardly had any sleep and if I had’ve stayed another night (that I had already paid for) my checkout was 10am so there was no chance of a sleep in. I needed sleep so I packed up and checked out a day early. I went to reception to check out. There was the receptionist (who checked me in the day before), another lady behind the desk and 2 housekeeping staff. I said I’m here to check out. The same lady who checked me in (I think her name was Rachel) said okay and I gave her my room number. She couldn’t find the paperwork and I said that’s because I’m checking out a day early. She said ok, took my key card and that was it. I heard the housekeeping staff mutter under her breath oh no but that was it. No one wanted to know why I was leaving because they already knew. I was sleep deprived from having stayed in room 55. Turned out to be an expensive night in a crappy hotel room. Appalling customer service. They should be ashamed of their work ethics! I would never hire you. The hotel was situated close to the heart of the port. The room was ideal for us, as I stayed with my sister and niece. The girl at reception was so helpful both when we arrived and departed as well as when I booked over the phone. Made to feel welcome on arrival. Room was very spacious and the air conditioning was turned on. Lovely and cool which was nice after the heat outside. Unfortunately the restaurant was not available on a Sunday night. We had business in the area and combined this with a short break. We chose the Mercure as we could use some points and we had visited previously. Check in was efficient and welcoming and we were allocated a re-furbished room in excellent condition. We dined in the first night and were pleasantly surprised by both the quality of the meal and the price. Excellent value and very friendly and good service. Overall we enjoyed the visit and will return. The stay was whilst Echuca experienced 43 deg temperatures. A cool bedroom was nice to retreat too in the afternoon, the AC coped well, but warm bathroom and pool water, nicer breakfasts as restaurant is &quot;independant&quot; made for a pleasant stay. Mercure Port of Echuca is the perfect getaway spot! We had a great time spending two days with just one overnight stop at Mercure Port of Echuca. The hotel is on the main drag, walking distance to all attractions is perfect. We did some shopping at one or two of the upmarket fashion stores and window shopped all the others. The bar/bistro area at the hotel is perfect for indoor or outdoor dining with views over the pool, how good is that. Our room was upstairs looking out over the highway but all those trucks went past without bothering us in the least. Our bed was so comfortable it was hard to leave.